The Discovery series is new to the loudspeaker market, but its defining characteristics are well known: superior sound, a solid construction, and a wide range of variants. Combining these three elements - plus a wealth of technical features and finesses - gives our customers the possibility of acquiring a tailor-made Scan-Speak solution at a lower price point compared to our other product lines. Examine the eight midwoofer and six woofer variants, and discover the benefits of superb low frequency performance. Ranging in size from 15 - 26cm, they meet several ambitions and goals, such as a linear frequency response and high sensitivity. A linear X-max of +/-4mm is impressive, as is the cost efficiency that is achieved by using Asian metal parts and European soft-parts. 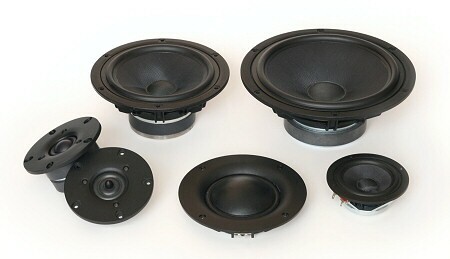 Products: 15W and 18W midwoofers as well as 22W and 26W woofers. With black coated fibreglass cones and rubber surround, they are built for performance. Venting the aluminium baskets below the spider reduces compression, providing an improved sound. Note that all sizes are available in both 4 and 8 ohm variants. The 25 and 32mm voice coil (15 & 18cm) and 38 and 50mm voice coil (22 & 26cm) variants ensure adequate motor power and power handling. Both dome and cone versions are available in the midrange section of the new series. The D7608/9200 dome midrange has been known for its superior performance for decades. It features a wide dispersion, high output (92dB @ 1W) and natural clean and undistorted sound as well as compact mounting dimensions. Within midrange products, you'll find the 10F cone full range unit. It is excellent for midrange reproduction, due to its compact and very powerful neodymium motor along with the black coated fibreglass cone and rubber surround. It tops out by producing 90dB @ 2.83V, an exceptionally high sensitivity for such a small driver. The aluminium basket contributes to the robustness of the design. The sound quality offered by this driver is a leader in the market. You can also count on the 15M cone midrange to be there when and where you need it. With a 25mm voice coil and ferrite magnet system, it provides high sensitivity. With special attention being paid to the diaphragm and surround as differentiating parts of the product, it provides excellent midrange reproduction, complementing the woofers and midwoofers of the Discovery line. Whether you prefer dome or ring dome tweeters, Discovery has your needs covered. The D2606/922000 tweeter makes its strong presence felt thanks to a 25mm dome, ferrofluid and a rear chamber. A lower cost version, D2606/920000, is available without ferrofluid and rear chamber. Expanding to include both dome and ring dome versions, the D2604/R2604 wide surround ensure that performance is impressive here as well, offering a lower cost alternative to the Scan-Speak Revelator tweeters. Add the very wide dispersion of the DX variant, along with the very low distortion of the XT variant, and some timeless units are born. The D2608/913000 also contributes exceptionally well thanks to the built-in high sensitivity and rear chamber. This driver has been designed as a very price competitive alternative to our Scan-Speak 1" classic tweeters, and has been manufactured at Scan-Speak since 2005.